Bangladesh Association of Software and Information Services (BASIS) wants to create an inclusive growth eco-system. Collectively BASIS will foster the development of ICT Sector. With this aim in motion BASIS’s 20th Annual General Meeting (AGM) held on Saturday (Mar 30) at IDEB, Kakrail, Dhaka. 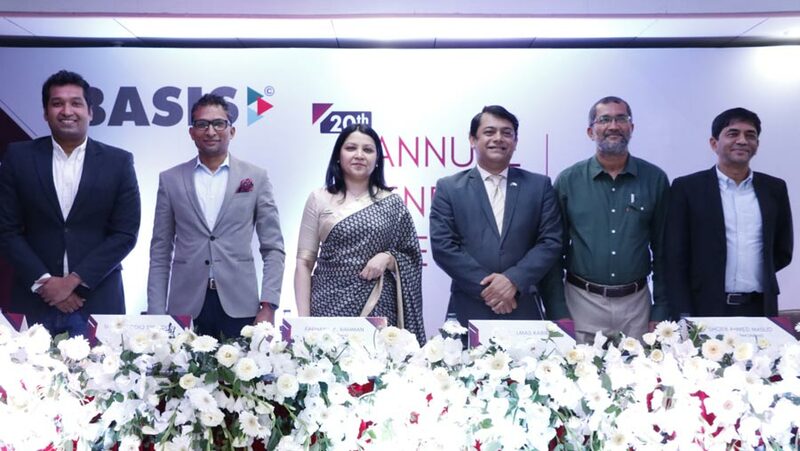 BASIS’s president Syed Almas Kabir presided over the AGM, where more than two hundred members of BASIS were present. Alongside the president, Senior Vice-President Farhana A Rahman, Vice-President (Admin) Shoeb Ahmed Masud, Vice-President (Finance) Mushfiqur Rahman, Director Tamzid Siddiq Spondon and Director Didarul Alam were also present. Vice-President (Admin) Shoeb Ahmed Masud briefed the members about BASIS 2018’s activities through his presentation. Where, Vice President (Finance) Mushfiqur Rahman presented audit report for the year 2017-18. After the presentation members took part in the conversation regarding both of the issues. On the AGM BASIS president said, "In our 20 years of journey BASIS has become the ICT apex body of Bangladesh. Government and non-government stakeholders look up to us, seeks our suggestion to regulate the ICT Industry of Bangladesh. We want to create an inclusive ICT Trade Association. Together we will create better growth eco-system. It will foster the development of ICT Sector." He added, with the help of everyone BASIS has successfully organized The largest regional technology congress - 15th BASIS SoftExpo. In this regard BASIS EC & members present there thanked BASIS SoftExpo 2019’s convener & Senior Vice-President of BASIS Farhana A Rahman for her relentless efforts to make this event a great success. Former BASIS presidents, former directors of BASIS, standing committee members, Chairman & Co-chairman were also present.